Permanent waterproof ink for a fountain pen is an essential part of my sketching kit. For a long time I used just Noodler’s Bulletproof Black, which is a good waterproof ink – and then I discovered De Atramentis Document Inks that are available in black and a series of colours. These inks are a pleasure to use because they flow so well, never seem to clog or dry up in the pen, and are reliably waterproof. 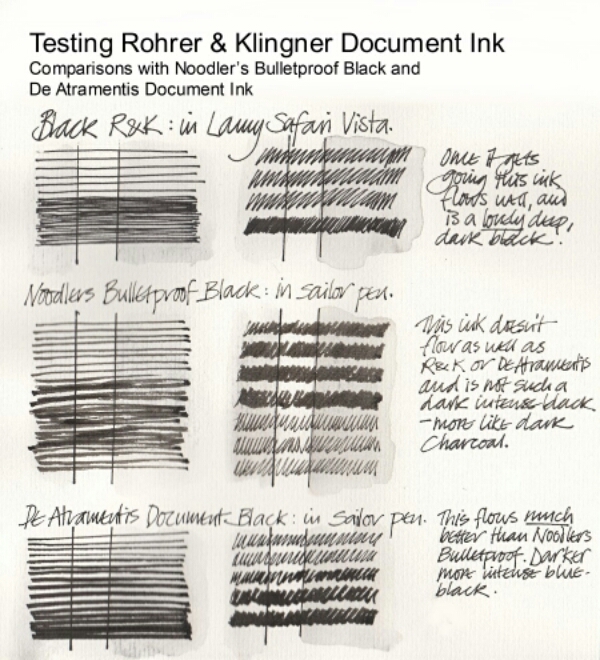 Now there’s a third choice, Rohrer and Klingner Document Ink stocked in the UK by The Writing Desk. These inks state that they are ‘Permanent and waterproof inks suitable for all fountain pens, certified to ISO 12757-2. Water, light, alcohol and bleach resistant.’ I’ve been testing them against Noodler’s Black, and De Atramentis black and coloured inks. 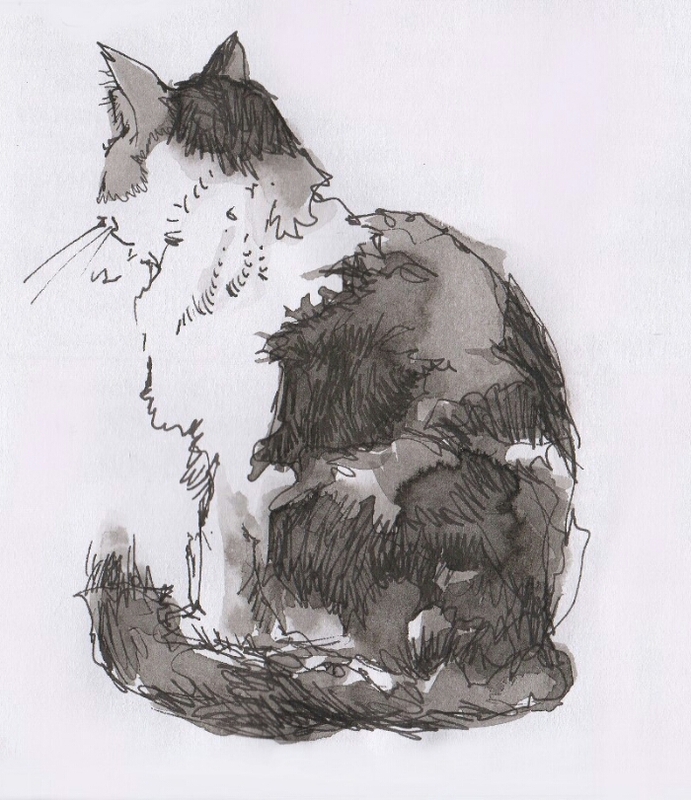 Cat; Rohrer and Klingner Black Document ink in a Lamy Safari fountain pen, with watercolour wash.
d) how they feel in use – how freely they flow on the paper. a) Colour: De Atramentis and Rohrer and Klingner are both rich intense blueish blacks; of the two I’d say the R & K is slightly darker. Noodler’s is warmer, more of a charcoal black. Testing for water resistance on ‘reliable’ paper where ink seldom lifts with a wash of water – though Noodler’s can be unpredictable! Plus a test of a mix of R & K mixed grey, Light Blue with a drop of black. b) Water resistance: both Noodler’s and De Atramentis achieve resistance to water by reacting to the cellulose in the paper, and I believe that Rohrer and Klingner inks use the same chemistry though I haven’t been able to find any technical information to verify this. Although all three inks are waterproof, this varies according to the paper so I did the first tests on paper I knew would be challenging, and a second set on paper that usually accepts the ink well. I did tests applying water over the ink immediately (the right hand columns on my test diagram) and then after about an hour (the columns on the left). 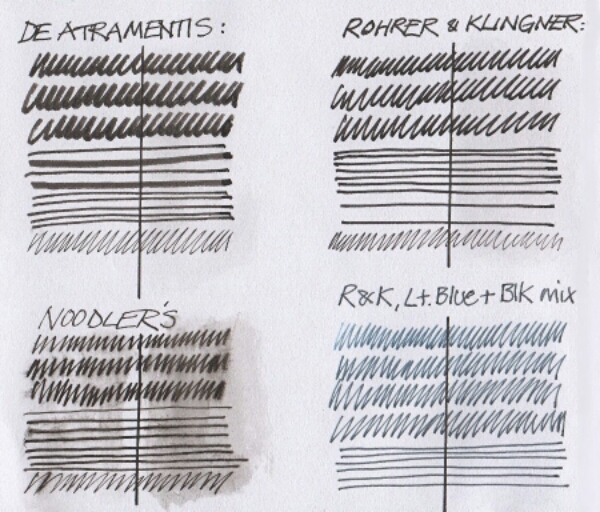 Of the three the De Atramentis came out top, with R & K a very close second and Noodler’s third. On the ‘challenging’ paper you can see the ink has lifted and bled a fair bit in some cases; on my regular ink-friendly paper the Noodler’s still lifts a bit (OK, actually it surprised me and bled a lot – it’s more unpredictable than I’d thought) and the Rohrer and Klingner pretty much stays put, and so does the De Atramentis. c) Flow in the pen: a lot of people report problems with Noodler’s ink drying in the pen or with it not flowing well, and although in my Lamy Safari I’ve never had this trouble I have found it a problem in a Sailor pen. (I now use De Atramentis in this and it’s a huge improvement). I tried the R & K in a Preppy pen as well as my Lamy Safari and found the black tends to dry in the nib a bit, so that when I came to start drawing after not using the pen for a while the ink wouldn’t flow until I got it going. (Rohrer and Klingner do tell you always to replace the cap of your pen when not in use, and I always do this anyway, with any pen). The coloured inks don’t seem to be so inclined to dry in the nib – the Light Blue in my Preppy pen behaved impeccably. d) Flow on the paper: the Rohrer and Klingner inks are a joy to use. Like De Atramentis Document ink they feel wet and smooth as they slide onto the page and flow consistently so that drawing with them is a real pleasure and they performed well in all the pens I used to test with – the Lamy Safari, the Sailor with fude nib, and a Preppy. 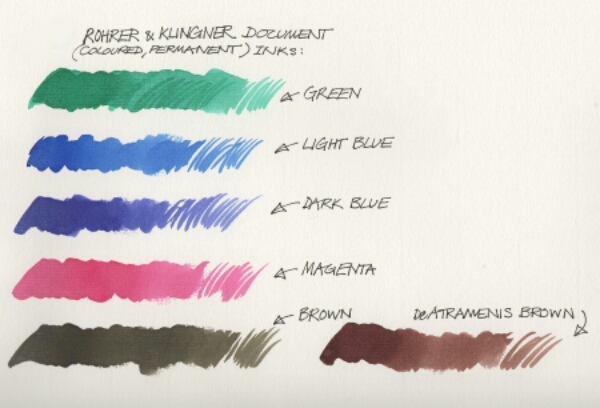 I painted a quick colour chart of the R & K range and was able to compare the brown with the De Atramentis Document brown (which I use a lot); the Rohrer and Klingner is darker and cooler, the De Atramentis warmer and more orange (which I like, for drawing). Finally, I realised that the Light Blue would make a lovely soft blue /grey with a touch of black added to it. From the colour charts online this Light Blue looks paler and slightly cooler than the De Atramentis Blue. I wonder how this mixture would compare to De Atramentis Fog Grey – (which I don’t have but would like to get). I’ve now mixed a small amount of black into the blue so I can try it in a pen. 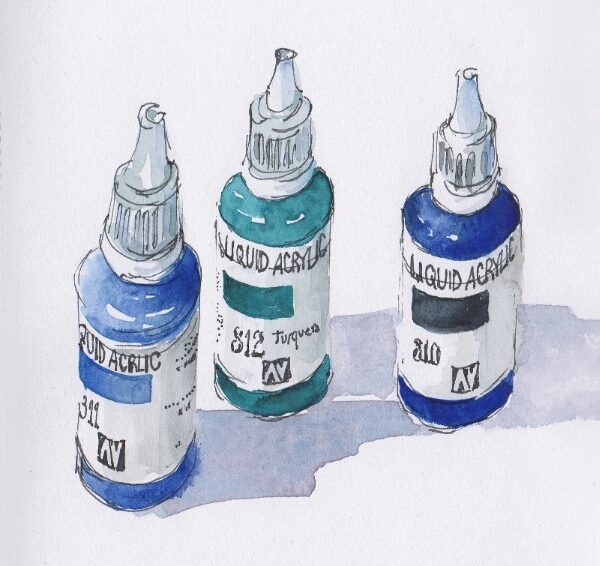 Trying my mixed grey R & K ink in a Preppy pen – drawing some little bottles of liquid acrylic and then painting with watercolour. 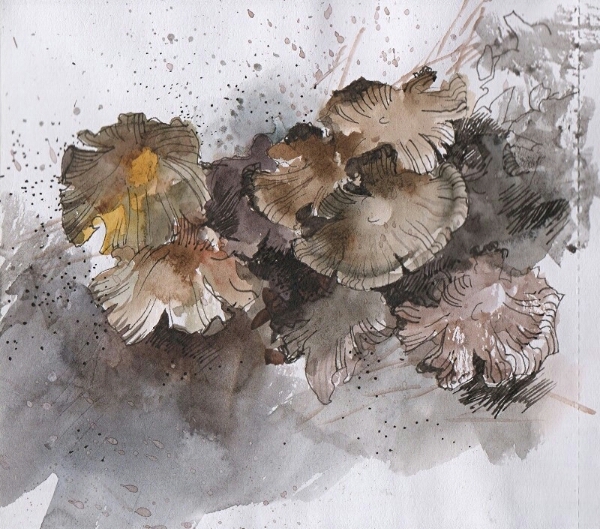 I wanted an even paler line colour than this – I overdid the amount of black I added to the ink mix – an easy mistake to make! I’m impressed with the Rohrer and Klingner inks. They’re smooth flowing, very resistant to water and the colours are lovely. I particularly like the Light Blue because it mixes with black to make such a nice pale blueish grey. The black is beautifully luscious, rich and dark and flows nicely in the pen, and my only concern is that it doesn’t always start to flow straight away when the pen hasn’t been used for a while. I don’t know what would happen if you left a pen unused for several days or even weeks – I haven’t had the inks long enough to try this out. Will I be using them? I certainly want to go on drawing with the light grey mix I’ve made, so the Light Blue is on my shopping list. The other colours are probably not really useful for me personally, but they’re tempting. As for the black, apart from mixing small quantities of it with Light Blue I’ll probably stick with De Atramentis Document Black, as it does everything I want it to do – but I’d happily use the Rohrer and Klingner Document Black as a replacement, and from now on Noodler’s Bulletproof Black is a fall-back, and going into reserve.